Sweet pink roses and carnations are a simply adorable gesture for a new baby, or any occasion! 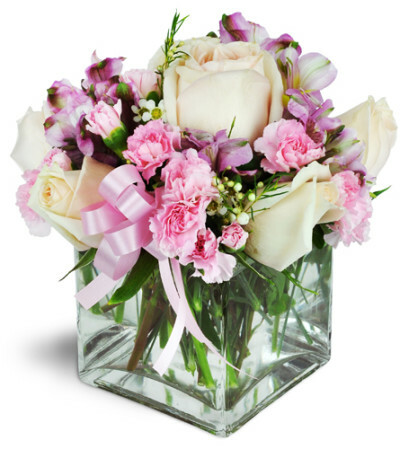 Pale pink roses and pink mini carnations are arranged with alstroemeria, waxflower, and more in a modern cube vase - topped with a perfectly pink ribbon! My mom loved the flowers you put together and they were delivered super quick! Thank you!! Mom loved the flowers, they put a smile on her face. 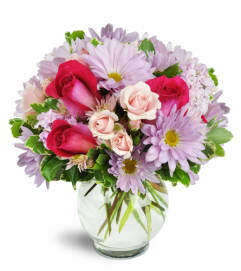 Flowers Plus is a Lovingly Florist in Sarnia. Buying local matters. Discover how Lovingly supports local florists. 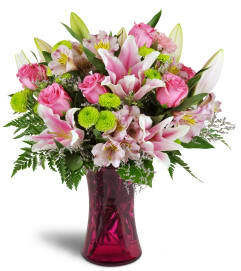 Copyrighted images herein are used with permission by Flowers Plus.